The Reds themselves were heterogeneous, especially in the first year of the civil war. From 1917 to 1918, the Red Army was a collection of revolutionary factions which Included the Bolsheviks, Mensheviks, Left Socialist Revolutionaries, Right Socialist Revolutionaries, the Jewish Bund, Anarchists, various smaller agrarian peasant and 'social democratic' parties, and even groups known as the 'Greens'. The Whites made little or no distinction between these elements and referred to them simply as 'Reds'. The Bolsheviks in fact considered themselves to be the only 'valid' Reds. Consequently, step-by-step, they began to suppress all factions that did not fully support their own points of view, a process complete by 1922. Unlike the Whites, who generally acted honourably if inflexibly, the Bolshevik leadership had no scruples about forming temporary alliances against a common enemy (hen liquidating that former ally in turn. The term 'Bolshevik' actually meant 'majority (socialist)' while 'Menshevik' meant 'minority (socialist)'. Prior to 1903, both the Bolsheviks and Mensheviks had belonged to the Marxist Russian Social Democratic Labour Party (RSDLP). Both believed in leadership by an elite core of professional revolutionaries, but whereas the Mensheviks supported wider participation by party members and cooperation with the existing government, the Bolsheviks determined to limit party membership and to attack the government from without. Irreconcilable differences continued until the final split in 1912, after which the Bolsheviks carried the RSDLP moniker alone. After using the Mensheviks for their own purposes during the civil war, the Bolsheviks outlawed them in 1921. The Socialist Revolutionaries (SRs) were another matter. 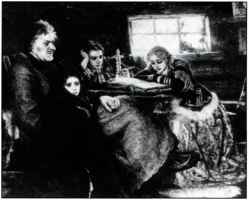 Russia was a predominately agrarian country and the SRs were committed to a platform that addressed the needs of the peasants in contradistinction to the Bolsheviks who supported the industrial proletariat, who, they believed, would lead world revolution. A critical issue was the distribution of land. While the SRs believed that land should be socialized, or divided up among the working peasantry, the Bolsheviks pushed for the nationalization of land, a concept eventually leading to the state-operated communal farms. Immensely popular among the peasantry, the SRs formed the largest political bloc in 1917. In the pre-Constituent Assembly elections of 12 November 1917, elections intended to select delegates to the assembly scheduled for January 1918, the SRs polled 57 per cent, with the Bolsheviks a distant second at 25 per cent. However, the SRs were split internally. From summer 1917, the (Left) SRs had frequently supported the Bolsheviks, especially over the Issues of ousting the Provisional Government by coup and immediately confiscating and redistributing land from the landowners to the peasants. Lenin himself had determined to overturn the results of the pre-Constituent Assembly elections held in November, elections that he had lost. As delegates to the official meeting of the Constituent Assembly prepared to take their seats in the Tauride Palace in I'etrograd on 19 January 1918, they found themselves locked out and turned away by Bolshevik armed guards. Lenin announced the dissolution of the Constituent Assembly that same day. The Left SRs also found themselves in opposition to the Bolsheviks after Lenin and Trotsky blessed the signing of the Treaty of Brest-Litovsk in March 1918 to conclude Russia's participation in World War One, a treaty that dismembered large portions of Russia and imposed a punitive peace. Thereafter, many Left SRs decided to cooperate with the Allies and reform an Eastern Front against the Central Powers. 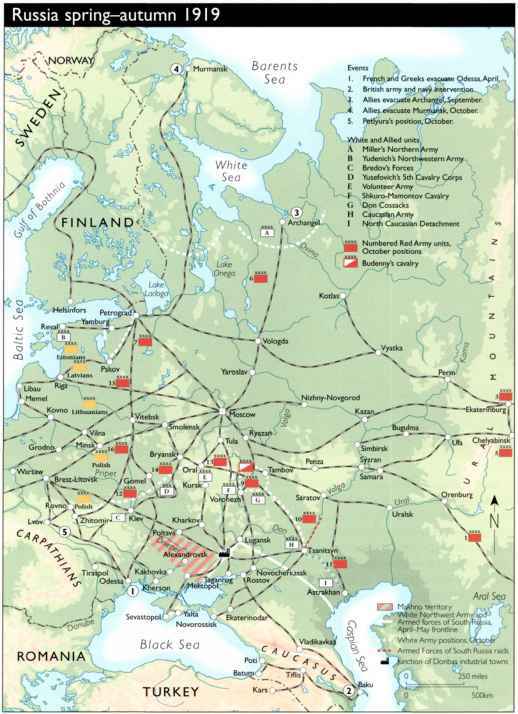 Allied landings in Siberia and North Russia which occurred that spring and summer, the Left SRs rose in revolt against the Bolsheviks in Moscow and at Yaroslavl in July, and after days of street fighting were slaughtered by the Cheka and the elite Latvian Rifles. Survivors of the SR Party in general who had not accommodated themselves to the Bolsheviks by the end of the civil war were sentenced to death in 1922. The Reds also contained in their ranks many Anarchists who were often characterized by themselves and their enemies as 'Black Guards', black representing the colour of negation, the removal of state authority. The Anarchists were a genuine grassroots movement believing in local autonomy and freely elected 'soviets', or councils, and therefore chafed under the increasing bureaucracy and centralism Bolshevism came to represent. They believed in the revolutionary seizure of land and its redistribution to those who would till the land, but they were hostile to the communal, state-controlled farms espoused by the Bolsheviks. The Kronstandt Rebellion of 192 ] vfflS an attempt by the sailors of the Baltic l:leet to ensure that the Bolshevik Tarty adhered to the original principles of the revolution, such as the rights to free assembly and the establishment of trade unions. However the rebellion was ruthlessly crushed. as in the violent Antonov Rebellion of 1920-22, while others were merely hiding out from military conscription, whether Red or White. Some Greens called themselves 'Forest Brethren', and lived in the deep woods or taiga with an almost piratical code of life and honour. 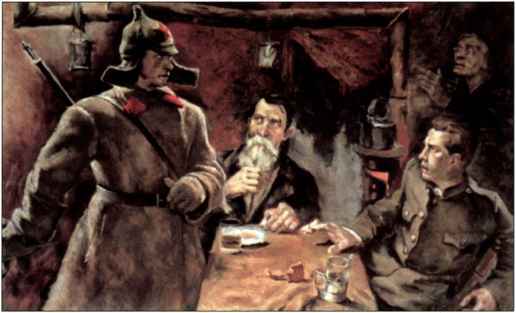 Soviet historians estimated that of the 100,000 or more Red partisans operating against Kolchak's White Siberians in 1919-20, probably over half were actually Greens in orientation. Characteristically, the Red Army brought the Greens to heel at the end of the civil war, although survivors managed to resist in Siberia and Central Asia well into the 1920s. The Red Army, therefore, was a coalition of factions content to fight the Whites, and then each other when the Whiles were no longer a threat. As the civil war progressed, the Red Army became more homogenous, more Bolshevik in nature. From the start of the Revolution, the Bolsheviks possessed several key advantages over their opponents. Consolidating a revolution is never easy, and for that reason the great majority throughout history have failed. Extraordinary leadership is essential, leadership that includes an abundance of grey matter, clarity of vision, the ability to adapt ideology, if only temporarily, along a more pragmatic, even unscrupulous path, and an iron ruthlessness to sacrifice - and to making others sacrifice - for the end goal. These things the predominately middle-class, professional-revolutionary Bolshevik leadership possessed. Irrevocably committed to destroying one world and building another, they had the almost astounding arrogance to create that which had not been created before, a world that only existed as a theory, thoughtfully formulated on paper while in exile, or feverishly composed in the mind while running from the tsarist secret police. Equally important in their first year, they had won the support of three key military forces that would allow them to dominate any one opponent In a given time and place. These were the armed sailors of the Baltic Fleet, the elite Latvian Rifle Division and the dedicated 'proletarian' workers who made up the majority of the paramilitary Red Guard. Moreover, the Bolsheviks were ensconced in Moscow, Petrograd and central Russia, where the many arms factories and stores of weapons that had supported the country's campaigns in World War One lay. Additionally, central Russia was comparatively rich in railways. These facts allowed the Bolsheviks to equip their military forces and deploy them where needed. infantry. As for cavalry, the Bolsheviks largely employed the inogorodnye who lived on Cossack lands and who were familiar with horses but were not themselves Cossack. The Reds, like the Whites, utilized symbols representative of their movement. For centuries, the colour red had suggested revolution, but it had also been the favourite colour of the tsars. From the red facings of St Basil's Cathedral in Moscow to lied Square itself, to the fortunate double meaning of the word krasnaia - which can mean either 'red' or 'beautiful' - the Bolsheviks were able to hijack the colour red for their own purposes. Red armbands with black letters indicating the particular military unit were worn by the Reel Guards, lied metal stars adorned furashki (caps) while cloth stars appeared on the uniforms of 1919 and 1922. Red stars on military equipment or political placards suggested a new future, especially when linked with the red and golden rays of dawn. The golden hammer and plough placed on red flags and billboards linked the new movement with progressive changes on behalf of the industrial proletariat and peasant. Overall the Bolshevik message, whether direct or subliminal, was simple and easily understood by Russia's illiterate: peace, land and bread. The slogan 'All Power to the Soviets' - the soviet supposedly being a 'democratic' council in which the worker or peasant received representation and justice -appealed to those who did not yet understand what Bolshevism and the new soviets were all about. These and other slogans were painted In suggestive collages, and in narrative, almost comic-book scenes, in the new artistic style known as avant garde. This art appeared throughout the Red heartland on town posters and on the sides of special agitation-propaganda trains and riverboats. Symbols were also designed to replace political authority in the minds of the people. Depictions of Lenin appeared everywhere, especially in places where images of the tsar had been. Those unable to comprehend Bolshevism nevertheless ascertained, if only by suggestion, that there was a new figure of power, a new lied Tsar. Who were the reds the greens and whites?